Moorestown has been known as a Tree City USA for 26 years. The Tree City USA program has been greening cities and towns across America since 1976. It is a nationwide movement that provides the framework necessary for communities to manage and expand their public trees. Moorestown really cares about its urban tree canopy, so the maintenance of its trees is very important. Just in time for spring, the Moorestown Tree Planting and Preservation Committee has a number of tips for residents on tree planting and tree maintenance for the spring. “It is the time of year everyone should be cleaning up gardens, making sure the lawn mower works and shovels are rust free, sharpening blades and tuning up supplies because you’ll be working outside a lot more,” John Gibson, chairman of the Moorestown Tree Planting and Preservation Committee, said. April is “plant a tree month” and is also the month in which Arbor Day is celebrated. Gibson recommends planting trees this month, as it is also the month the Tree Planting and Preservation Committee plants its new township trees as well. Gibson said those who want to plant trees should really think about the type of tree and the spot you plant it in. Not only do you want to have a tree that would thrive in the environment it is planted, but also be sure to plant it in an appropriate spot to grow, away from power lines and houses. “Make sure it has room for the tree to grow. It might be small when you plant it, but hopefully it grow bigger,” Gibson said. Gibson said that Moorestown Tree Planting and Preservation Committee will be celebrating Arbor Day on April 29 at the William Allen Middle School. The committee will be handing out small trees for people to take home for free to nurture and grow. “April is plant a tree month so it’s a great month to plant a tree. I always say ‘The best time to plant a tree was 20 years ago. The second best time is today,’” Gibson said. For existing trees, now is not a bad time to start pruning as well. Gibson recommends cutting down low-hanging branches that are in the way as well as branches that rub against each other, as they are bad for the tree. For larger trees, Gibson said to be sure to get a reputable professional who knows what they are doing. He also recommended not tree topping, as that is bad for the tree. A big thing the committee wanted to remind residents is about good mulching practices around trees. Old mulch should be replaced with fresh mulch, which can be purchased in bulk from local vendors as well as bags in box stores. The committee says mulch should never be piled up against the tree trunk. Mulching in a “volcano” shape can make the tree more susceptible to fungus, insects and rodents. Instead, mulch in a “donut” shape. Keep mulch six inches from the trunk and mulch out as far as the branches extend above. Keep the mulch two to four inches thick. Every spring, break up old mulch and add new to maintain a two- to four-inch layer. Properly applied mulch prevents soil compaction, retains water in the soil for tree roots, keeps lawn equipment from damaging the trunk, moderates temperature, reduces competing vegetation and provides nutrients to the tree as it breaks down. As a reminder for tree lovers, Moorestown was found to have the emerald ash borer in some of its ash trees. Emerald ash borer is a non-native insect pest that infests and kills all species of ash trees. It was first discovered in 2002 and has since been found in 25 states and killed millions of ash trees. The township is closely monitoring its ash trees to determine when and if the trees need to be removed or treated. Township sites where trees are removed will be considered for replanting during the next planting cycle. 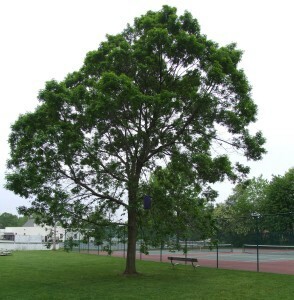 As the township does not know the number and location of residential ash trees, residents are encouraged to see if their tree is an ash tree and if it has been infected. The tree committee has assembled some information for homeowners, which is available on the township website under the Tree Preservation and Planting page. Gibson said if the emerald ash borer is caught early enough, the tree might be saved with treatment. Any treatments should occur between April 1 and May 15. Homeowners are cautioned to beware of unsolicited tree companies wanting to remove your trees and to use only licensed tree professionals when dealing with protection or removal of ash trees. To learn more about emerald ash borer in New Jersey, visit www.emeraldashborer.nj.gov/. “Trees are a very valuable resource. They provide shade, which helps with a/c bills in the summer, stormwater runoff, value of the house and improving air quality. Trees do a lot of good things for us,” Gibson said. To learn more about tree planting and maintenance or how to volunteer with the committee, visit the Moorestown Tree Planting and Preservation Committee website at www.moorestown.nj.us/185/Tree-Planting-Preservation-Committee or email the committee at moorestowntrees@gmail.com.